I have just started this fantastic Masters degree course at Bristol university. Last weekend my group went up to Oxfordshire & had a look around some gardens. The weather was amazing, we stayed at a really nice hotel in Woodstock & we were accompanied by our tutor, Tim Mowl whose knowledge & enthusiasm concerning gardens is seemingly endless. Tims’ knowledge really made the gardens come alive & I’m already starting to question all aspects of the design and planting. I have so much to learn & I’m so excited by everything I’ve experienced so far. I have a lot of work to complete & Tim expects 100% effort from us but I am really looking forward to it!! I have already noticed a change in my approach to dealing with my neighbours garden which I work on, I will have to be careful not to get too carried away! More to follow, when I have time! Previous post: have any of you ever considered studying garden history? Good luck with the course Karen. It sounds very interesting. 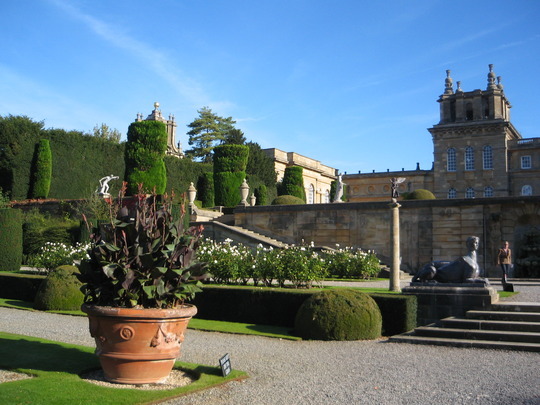 As you know there are lots of historic gardens to see and appreciate in this part of the U.K.
there is a link on page 17. What a great course to join! I know there's lots of work, but it sounds so interesting. Good luck with it and keep us posted! A fascinating course, and it looks like you'll be visiting very interesting gardens as part of your studies. I hope you'll have time to report back to GoY. We'll be eager to read your thoughts and ideas. In Praise of our Parks parts, 1,2,3 and 4. Good luck with your course Karen. Sounds fascinating. There are opportunities to study such interesting subjects these days. Hope all goes well with your Masters. Sounds really interested, good luck Karen hope all goes well. Thanks for the responses, nice to know my blog has been read!! I will have a look back at other blogs, thanks for pointing them out to me Terratoonie. Good luck with your course Karen , sounds fascinating ! Good luck from me too, Karen. Looking forward to hearing more about the course as it progresses, your enthusiasm is contagious. have any of you ever considered studying garden history?